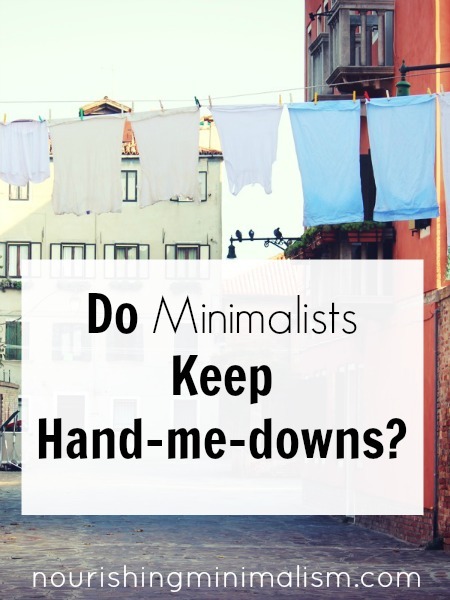 If you are a die-hard minimalist and there is nothing in the children’s closet (or at least nothing on the top shelf) then sure- keep the clothes! Box them, label the front with gender, size and season and set them in the top shelf of the closet. That’s the whole benefit to minimalism. You have what you need and it’s organized. BUT… if you are still in the midst of decluttering and your children’s closets are full and unorganized, I recommend letting go of the hand-me-downs. Because I’ve been there. I didn’t have room in the kid’s closet. The clothes got placed in the basement- in bags, in boxes, where ever I could put them, just to get them out of the way. And then I forgot about them. When the kids needed new clothes, I never remembered what I had and I’d run out and get what they needed. For one, it was easier than trying to dig out the right box, or open the correct garbage bag. But most of the time- I didn’t even remember what sizes I had, what season they were or anything about them. We had too much stuff, I wasn’t able to organize it all. Then, of course, I would feel horribly guilty for spending money on clothing that I didn’t actually need to purchase – and I would find the clothes after the kids were already past that size. Take extra/outgrown/not-in-use clothing to the consignment shop. Use the consignment shop as your “storage”. When your child needs a bigger size, shop with the credit that is there. It’s being responsible, and you don’t have to try to organize more things. Because, let’s face it: when the whole house is cluttered, organizing isn’t effective. Don’t “should” yourself with this. In the end, after you’ve rid your home of the excess, giving items like hand-me-downs a place to belong will be easy. Until then, be gracious with yourself and if you don’t get to that “minimalist” state during these years when the kids are growing so fast- that’s ok too. Make use of the consignment shops to trade in- that’s what they are there for. With four girls in a row (born within five years), another daughter a couple of years younger, and two boys a few years apart, I absolutely save hand-me-downs! BUT! They go into bins that are clearly labeled and they’re stored outside of the house. I typically do bag too-small clothes and toss them into the garage, but I get to them frequently enough. When I have the opportunity to go through a bin, I make sure to cull anything I no longer want to keep and it goes straight to the donation pile. It’s time-consuming, sure, but I can’t imagine the amount of money we’ve saved. We also have separate bins for swimsuits, sports uniforms, Halloween costumes, and so on. They’re only the things that are truly useful to us and they sure come in handy every time someone bumps up a size of the seasons change. For us, the big key is keeping anything extra out of the house. Can you be more specific in what you mean by “out of the house”? Do you keep them in a garage or a storage unit somewhere? Thanks! I do keep hand-me-downs and I do ok with them. Yes, they are in the attic but they are labeled and sorted by size and season. I do great with clothes that I’ve bought and saved from boy to boy but where I fail is with clothes given to us by others such as cousins. They don’t arrive in nice organized bins and even when I try to organize them, I don’t know that a Sz 8 should be in the Sz 10 box because it runs big because I don’t have experience with these clothes and then I get a BG mess. So, I try to only accept certain things such as coats and some sports equipment to save my sanity. We rarely buy clothes, because we get so much handed down. In the basement, we have a storage rack just for clothing. There is a shelf for each of the 3 kids, plus one labeled “unsorted.” When we need bigger clothes for someone, I just check that shelf. Anything that I run across that we won’t need anymore, goes into the donation pile (usually my sister in law, whose kids’sizes are inbetween mine). When I have some time, I sort newly arrived stuff onto the appropriate shelf. We have a separate spot for winter gear and for footwear. There is plenty of space down there bc we’ve cleaned out and donated so much! I had two girls five years and two weeks apart. I saved all of the clothes that my first daughter wore. Fortunately, since they were born in about the same season and grew at the same rate, my second daughter wore most of the clothes saved. However, I had a LOT of clothes, partly because they ARE five years apart. If I had it to do over, I would have been more selective and kept favorites and those in the best condition. I wish I had had Rachel’s advice back then; I would have done many things differently! I trade hand-me-downs often with cousins and friends. We started a clothing swap at church just for this purpose. I keep a large bin on the top shelf in our laundry room. As my kids outgrow items and seasons change, I throw the clothes right in the bin when I’m folding laundry. When the bin is full I sort it and give it to my sisters for their children or send it to church for the swap. When we receive hand-me-downs I sort them and put them in labeled plastic drawers and bins that are in the closet. This method has worked well except that we sometimes get too much handed down. I realized when clearing out last season’s clothes that my son didn’t wear half of the items in his drawers. I’m going to start only keeping about half the hand-me-downs to save room. I’m so grateful for hand-me-downs that I’ve always kept them even when I felt like they took too much room and stayed in the garage for a while. We couldn’t afford new clothes for all 3 of ours while they were going through new sizes every few months. My kids would have been naked if it weren’t for hand-me-downs! Even when I decluttered everything else, those stayed. I got rid of all the clothes that were worn out. Jeans with holes in the knees, shirts with chewed-on collars, etc. I save only the good clothes/pajamas and shoes. I put each size into a different box. If it doesn’t fit in that box, it goes to GoodWill. I don’t know exactlyhowmuch of each item I save but it’s something like 2 shorts, 2 or 3 pants, 3-5 short sleeve shirts, 2-4 long sleeve, a couple pairs of pajamas, and 2-3 pairs of shoes including church shoes. The boxes are stored inthetop ofmy oldest son’s closet. I’m a minimalist but I’m also frugal. I don’t have the money to be buying new clothes every time someone outgrows something. That’d be about $200 every couple of months, not including shoes–my oldest needs the widest shoes we can find which costs about $35 a pair! After having four children in five years, I’ve learned what works for us. My boys are about eighteen months apart, so clothes pretty much go from one boy’s drawers to the other’s. My girls, however are five years apart, so I’ve learned to be more careful about what I keep. Some things don’t stay nice in storage or are not worth saving, so I pass them along. When we receive hand-me-downs, I sort through and see what is useful for us. If I already have what I need in a particular size, I pass them along to someone who can use them. It’s easy to see what I need because everything is sorted, organized, and labeled. I’ll confess that I am not a minimalist, but I am working toward a simpler life. I have been de-cluttering a lot the past few years. I didn’t hit 2014 in 2014, but I got to over 1800, which I consider successful. I have de-cluttered enough that I can see and feel the difference, which is encouraging. I’ve always been mostly organized, so my clutter hasn’t been as out of control as it could have been. I’m seeking to make our home more peaceful through this process. I do keep hand me down, but I have set limits. My first two kids are boys and only 2 years apart. So, I only have 1 size “in between” in the top of the closet. HOWEVER—I did have an issue with getting too many hand me downs. I did have to politely tell a few people “no”, and then one person dumped some on me that didn’t even ask. In either case I sort through the hand me downs and really think about what I will use. I only keep some and pass the rest on to other people who *need* them/ask for them. At first I felt guilty about giving them away but I got over it by mostly keeping it in the family still, and also realizing that most people just wanted it gone and didnt care what happened afterwards. There is no way I’d be able to afford brand new clothes and go out and buy something anytime I needed. Really the only things I’ve had to buy for my boys is shoes, socks, and underwear. For my girl I decided to say “no” to the hand me downs and shop at garage sales to save me the hassle of re-homing the things we didn’t need, since I like specific clothes (for example- I hate onesies with snaps because they are difficult for diaper changes). I miss the saved money, but I do like how I don’t have a bunch of clothes I don’t need/want. I have two boys and we hope to have more. We get lots of hand me downs from generous friends, and lots of gift clothes from generous grandparents, so we’ve hardly bought any clothes or shoes for either of our boys. It’s been a huge blessing! But in order to keep the storage at bay (I wouldn’t call myself a minimalist, but I’m moving more and more that way), I only keep bare minimum things (best quality, variety) once the boys outgrow them. Enough that there would be just barely enough for another kid as is, but that if we then receive more clothes are gifts, they are welcomed, and not groaned over because I already have so much. My sis-in-law used to belong to a group of women who had penny auctions every so often. (She told me that groups like this had been meeting since the great depression days.) Women would get together with all the things their kids had outgrown (and the odd household item as well) and take turns auctioning off their items. When it was your turn, you’d put a bowl in front of you, auction off the items one at a time to the highest bidder — and your bowl would slowly fill with coins, usually small ones. Most items went for under a quarter back then. They might go for 50 cents or a dollar now-a-days. The sellers each got to keep the change their items earned. Everyone got rid of some things that they didn’t need any more, bought things they did need, and they had fun doing it. Except in rare circumstances, everything that remained unsold at the end of the auction was donated to Salvation Army or another charitable organization. Yes I do keep hand me downs. I dont believe in spending extra money to be a minimalist…in fact, it is one of the reasons that I became a minimalist. To save cash. I understand that things work differently for everyone, but with less things in the house, it is unlikely that I will “forget” something that I will need. We have three girls- nearly 11, nearly four, and 8 months. I keep only very special items belonging to the oldest as 6 1/2 years is too long to hold on to things. For example her flower girl dress from our wedding, or a very good raincoat. I give most of what Miss 11 outgrows to a friend with a tall 7yo. I kept a lot but not all of Miss 4’s baby gear and what toddler clothing survived and it’s saved me a fortune. Baby has a dresser with four drawers and as she outgrows a size I empty the top draw (full of the clothes she currently wears) and move all the other clothes up a draw, making space for the best of what I’ve just cleaned out of Miss 4’s closet. I only keep shoes that are in new condition. With two girls, for sure I keep hand me downs. The annoying part is when someone tries to give me size 10 clothes when my daughter is only in size 4. I appreciate it (free clothes = good) however I don’t want to hang onto them for six years. I’m expecting another child (gender is a surprise) so it’d be foolish not to keep the already outgrown clothes. However, it’s a boy, I’m purging the stash when the baby naps! I have three boys 2-2 1/2 years apart so there is little turnover time. We shop at yard sales so we are cognizant of the next size. I have the next three sizes for my oldest sorted labled and stored cleanly in our storage loft in our garage. I have an inventory list of those items in my notebook so i know what to look for during the summer or at sales. The oldest’s clothes go straight to middle’s drawer and there is a box in the closet for his clothes while youngest grows into them. I’ve been more selective with what i keep the second go around. When i am given clothes i go through then right then and there and pass on most of it. I keep tabs on who can use it and take it straight to their house when possible. I ask first and only give them one size up. I sometimes list to sell. We also have a church swap. Last year i took four boxes of items, brought home two items. I do keep hand-me-downs. We get them from two different sources for my daughter. I make a point of keeping them organized in bins. I love going through them now and then and culling stuff I don’t really like. It’s a bit of an obsession! But they will be used, so I don’t see the harm in keeping them. I only have one kid and don’t plan on any more, but personally I wouldn’t keep the hand-me-downs unless they were really special or I had kids that were very close in age/size. For me, hanging on to stuff “just in case” or “for later” negates all the hard work I’ve done to pare it all down. I have started getting in the habit of purchasing things when I actually need them (rarely), and buying quality items that last, instead of trying to hang on to stuff for years and make it work (I used to love doing this and managed to build a huge fabric/craft stash that was out of control). This is just a personal preference though; for some, minimalism might mean never buying things when you could use what you have on hand, and for others it might mean not storing things that you don’t have a current need for. Since my house is so tiny, I opt for the latter. Currently, we save outgrown clothing that might be useful for playing, art, getting dirty, etc. but after a year or so, that stuff goes and we update for the new school year. I’ve got two girls; 3 years old and 8 months old. I limit myself to keeping one storage box of clothes per size for the 8 month old. I do however have a mother in law who loves buying my girls very impractical frilly dresses and they can start to pile up. Consignment store is a fantastic idea. I’ll be trying that one! I keep some hand me downs. It depends on your situation. The biggest factor is how many clothes you keep in your kids drawer. I keep only enough for about a week. These are all comfy clothes like tee shirts. By the time they grow out of them, they are pretty much shot! I keep a trash bag in my laundry room for donations. Pajamas NEVER get saved… they are always very worn by the end of the season. I typically throw shoes and socks away because they aren’t even worthy of a thrift store. I take a bag to the not for profit thrift store every couple of weeks and I usually take a peek at the shelves while I’m there for the next sizes. I keep a list in my purse of what the kids need. The only things I end up saving are things they received that were already too small, or a select few things that I loved so much they were worth saving (like a dress my daughter wore on her birthday, or a sweatshirt my son wore all of the time as a toddler). I don’t have many “church” clothes because I am always afraid they will get ruined. The ones I do have I don’t usually save, because they just didn’t get much use out of them. I do save some coats and shoes if I loved them and are in a condition that I would buy again. If I didn’t have space though, I would toss them. I also save really good bathing suits and hats. We are blessed to have grandparents that cannot resist buying them a few new clothes every season. Now, I donate some off the bat because they aren’t something I would really have my kids wear. If they are, I will often get rid of some clothes in their drawer to keep the numbers to only a week worth of clothes. I pass some clothes in great shape to friends with kids in similar sizes. I do not pass on clothes that have any signs of wear. These are mostly “church” clothes or things I did not care for (colors didn’t work for us, words I didn’t like, etc). We live in a very small house and don’t have space to store many clothes. I keep the next sizes for my kids in under bed storage boxes so that I can easily add items I find before the season. I keep the handmedowns/keepsakes under my bed in grocery bags or plastic shoe boxes, labeled for size. I have a box for shoes in my garage. I cannot keep clothes in my garage or attic because we live in Alabama and the humidity would ruin them, and it stressed me out too much trying to vacuum seal bags to store up there. My philosophy is to wear out the clothes each season so you don’t have to store!